When it rains in Glasgow-based legal hackathons, it pours. The next event on the social calendar is Tech4Justice, a 48-hour hackathon hosted by the Law Society of Scotland and Legal Hackers Scotland. UPDATE: The event will take place from 18:00 on Friday 17th June at the startup incubator Rookie Oven in Glasgow [Map]. There is £3000 in prize money available. Young people and legal information – designing new ways for young people to access legal information relevant to them. Legal processes – using technology to help people navigate legal processes and documents, such as small claims actions. 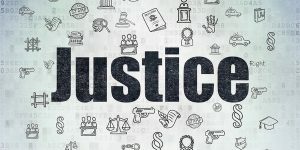 Access to justice professionals will present on each challenge at the start of the event, and they will be on hand afterward to work with teams. CREATe Researchers Kris Erickson Jesus Rodriguez Perez and Christian Geib will also be in attendance as team mentors. To register for the event or for more information, continue to the EventBrite page here.